The Euro 2008 Final is on Sunday 29th June from Vienna and it will see Germany play Spain. Spain have not been in a major final since the 1984 Euro championships when they faced France. This is the largest game of international football between the World Cup Finals and one well worth a bet. We love Paddy Power for sports betting, and there Money Back Offer for the Euro 2008 Final is not to be missed! Paddy Power will refund all losing 1st/last goalscorer, correct score and scorecast single bets on this match if Cesc Fabregas scores at any time in 90mins. The troubles that have been plaguing British bingo halls may finally receive something of a reprieve in the near future due to a series of proposed changes to current legislature. After smoking bans, double-taxation laws and restrictions on the highly profitable jackpot machines combined to devastate the industry good news has been sparse for fledging bingo halls and the upcoming announcement at least holds some hope for the desperate. Although full details of alleged alterations haven’t yet been revealed the UK parliament has responded to cries for help from the Bingo Trade Association with the announcement that some positive change is on the way. Rumors are swirling regarding the possible lift of the current restrictions placed on the immensely profitable £500 Jackpot machines wherein limits will be based on venue size rather than an arbitrary number. This alone may be enough to keep the doors open on many halls across the UK and keep the business alive long enough for further planning. Sports Minister Gerry Sutcliffe is set to reveal the extent of upcoming changes and industry observers are sure to be waiting for any news with bated breath. British government has promised help for land-based bingo halls and established that the official attitude is nearly unanimous regarding the game as an essential communal institution. Considering the grim situation currently facing the entire business practice any repeals to current laws may have arrived just in the nick of time. ITV’s gamble on providing a free-to-play television bingo program has apparently paid off as rating surveys reveal a growing fan base. The large jackpots and no-risk game entry is a great opportunity for bingo devotees resulting in the overall success of “Bingo Night Live”. Players have been flocking to their computers during the broadcast in hopes of getting lucky enough to take home one of the enormous prizes. Even without entry costs those who tune in to “Bingo Night Live” receive cards for 90-Ball games which carry a £2,500 prize for a full house (within thirty-three or less calls) along with £1,000 for complete cards during other nightly events. The Magic Number and Minute to Win It offerings fully round out ITV’s substantial and wholly complementary fare and keep British players excited for each new airing. With the addition of new week-night hosts, Jayne Sharpe and Anthony Crank the show demonstrates no sign of losing steam. The high-tech system set up to keep the show running smoothly and easy play all come together to make “Bingo Night Live” a hit for ITV and game fans both. In a time when physical bingo halls are in great danger for continued survival the television program may be the winning ticket needed to keep the bingo industry alive. We have just completed and uploaded our review of Gala Bingo here at Findabet.co.uk. Gala Bingo is just about the largest UK online Bingo Hall, with an equally large amlunt of Physical Bingo Halls. Gala is a brand which is synonomous with Bingo in the UK. They have recently signed Sharon Osbourne as the face of Gala Bingo and carried out some prime time television advertising to promote the brand. Please read our review of Gala Bingo or go straight ahead and play Gala Bingo today. After Spain beat Russia 3-0 tonight, they will face Germany in the final of the Euro 2008 Championships which is to be playd on Sunday night in Vienna. For me, these championships have not been as good as usual, with England not qualyfying, the competition lost its sparkle somewhat with myself. Our Euro 2008 betting partner has been Paddy Power. They have some Fantastic Betting Offers for the Euro 2008 Final so be sure to give them a try. Hard times for physical bingo halls continue to worsen with the news of the NBGA’s necessary cancellation of their annual ‘Caller of the Year’ event. Although some private companies are still going through with their smaller-scale iterations of the award (such as Gala Bingo’s similarly styled offering) this move dramatically illustrates the financial difficulties faced by the UK’s largest Bingo group. The NBGA title is a longstanding competition that seeks to drum up big interest in the game of bingo and ultimately serves as a necessity for keeping the industry healthy and exciting. Without this opportunity many of Britain’s best bingo callers will be forced to continue enduring difficult times where hall closures and lack of exposure keep job opportunities slim and chances for decent salaries within the occupation scarce. Although there will be a definite lack of excitement for bingo fans interested in the annual proceedings this fall, the NBGA has announced plans to come back for a future event which will attempt to funnel withheld finances into an even grander party. The debt that forced this year’s cancellation is hoped to be shortly resolved so the company can ensure that no such bad luck continues for players, fans and their business alike. With the popularity of poker constantly raising it should come as no surprise that the 2008 World Series of Poker enjoyed the highest attendance records yet. From the early promotion of the $1,500 No-Limit Hold ‘Em games players and spectators quickly flocked to partake in the reputable series. The big jackpots and new games have all contributed to the excitement surrounding the WSOP with many amateur and professional poker fans coming out to take their shot at glory. This year’s addition of the pro-designed H.O.R.S.E tournament led to many accolades considering that the upper echelon players now feel as if they have a better venue for truly showing their skills. Just the same, even non-established card gamblers have the chance to qualify and make a name for themselves in many events during the WSOP such as the returning $75,000 first prize (which drew an estimated 3,500 competitors to the series). One of the biggest surprises to the WSOP scheduling this year is the postponement of the final nine Main Event player’s showdown to November 9th of this year instead of directly at the end of the July series. Even in spite of professional criticism regarding the series decision expect plenty of enthusiasm and coverage of the last plays this fall. Although Norway doesn’t condone various, existing gambling methods a recent poll has shown that government restrictions and illegal status doesn’t necessarily equate a lower numbers of players. With approximately €961 million being pumped into the industry and 82.9% of these funds currently diverted to foreign businesses it may be time for the country to take a hard look at their current policies. The Norwegian Gambling Commission polled over ten thousand citizens between the ages of sixteen and seventy-four, coming to statistical evidence that the nation’s gamblers aren’t declining but rather increasing with time. Findings reflected a 6.1% increase on betting practices overall during 2007 and an estimated total of 244,000 online gamblers in Norway. A little less than half of the sample group gambles from within the legal Norwegian Lotto but the rest of the numbers were constituted of players making use of internet casino, poker and sports betters who are essentially betting from outside of national law. Alongside these findings the Commission also reported that more than half of the phone calls received by the gambling addiction hotline are concerned with internet poker problems. In light of the survey the Norwegian government is going to have to address current legislature and its failure to provide safe gambling venues for the population. Hot on the heels of the Foxy Bingo review, we are happy to bring you the BetFred Casino Review. BetFred is a UK based book maker named after its founder, Fred Done. Fred Done and BetFred has been around the sports betting arena for quite a while and in 2005 BetFred launched their online Casino partnering with Playtech to host the casino software and games. Feel free to read our review of BetFred Casino or go straight to BetFred Casino to start playing. With an unprecedented success in Manila the CEO of Asian Poker Tour, Chris Parker has decided to keep the ball rolling with future high profile events. As the international market for poker play grows it seems only natural that the company has sought to provide further, great options for the upper echelon of gamblers. The APT recently announced that they would continue feeding into the increasing popularity of the new tournament theater by hosting an even larger series of games in Macau. Parker shared the news at the Dusit Thani Manila near the end of the six-day Manila events. He described plans for a $1,500,000 US prize pool (the biggest yet for Asian poker enthusiasts) to be guaranteed for players who are able to front the $300 or $5,000 buy-ins. After setting records with Manila being the most heavily populated poker tournament to ever take place in the Philippines the APT should be able to keep fans happy by assisting in the creation of an enormous Asian tournament network. The Asian Poker Tour is heavily promoting the game to a virtually untapped audience who have recently shown considerable enthusiasm. With the announcement of the Macau games it seems that no end is in sight for the growing continental demographic. We have just uploaded our review of Foxy Bingo here at Findabet.co.uk. Foxy Bingo has been around since June 2005 and is a great name in the UK Bingo arena. This has been helped by over two million pounds worth of commercial advertising on peak time television as well as sponsorship of various celebrities such as Katie Price (Jordan) and Jeremy Kyle. Please read our review of Foxy Bingo or go direct to play at Foxy Bingo. During the month of May leading bingo company, Crown Bingo was able to hit the £1,000 mark in their fundraising efforts for charitable donations. Through extensive promotion of playtime set to provide financial aid for a variety of organizations bingo fans have been able to enjoy gaming while contributing to the community at the same time. Crown Bingo raised money last month during a four-week campaign for BLISS, a UK-based charity which raises money for the treatment of premature babies. Half of the proceeds taken in by certain Crown bingo games were given to the organization along with gifts from the popular ‘Knit-a-Thon’ wherein members sent in hand-made items to further provide assistance. BLISS Chief Executive Andy Cole expressed the charity’s thankfulness for Crown’s work and the direction of attention toward their cause which needs as much support as possible. In the past Crown Bingo have set-up fundraising initiatives for other charities such as St. Oswald’s Hospice, the Variety Club and various cancer research programs (including events scheduled for June’s upcoming Male Cancer Awareness Month). The continuation of Crown’s efforts is a great way for players to pump up the company’s business and enjoy some bingo while simultaneously donating money to worthy charities. WassPoker have recently implemented the addition of Caribbean Stud style poker play to their service, a move which is set to shake things up for visitors of their site and the industry as a whole. The leading site’s gaming repertoire is among the most extensive in the business and will continue to lead as an example for many others. Although it may seem like nothing much, WassPoker have been acting as something of a guide toward competing services and their Caribbean Stud offering means that many other sites are going to have to follow suit or fall behind. If the style catches on at Wass then we could expect to see an explosion of other sites in the business diversifying their poker options which results in good opportunities for consumers. Although many of the premier services fail to provide much more than Texas Hold ‘Em some of the most successful have hosted numerous styles for fans to enjoy. Caribbean Stud is a poker style which has long enjoyed popularity in casinos due to its simple but intense gameplay. The dealer and player are both dealt five cards with the dealer’s all being face-down except for the fifth. Caribbean Stud quickly becomes a game of bluffing and betting toward victory, a style not completely unlike the wildly popular Texas Hold ‘Em. The 2008 Wimbledon Tennis Championship starts today at the All England Tennis Club. Roger Federer is chasing his record breaking sixth straight win and he gets the play underway at 1200 on Centre Court against Dominik Hrbaty. Andy Murray missed last years chapmionships through injury and he is flying the flag for Great Britain, and our hopes for a home nation champion rest firmly on his shoulders. In the ladies, Venus Williams will be chasing her fifth Wimbledon title but she will face strong competition with the likes of Ana Ivanovic, Maria Sharapova, and her sister, Serena Williams all in good form. Throughout the Wimbledon Championships, our betting partner will be Paddy Power. They have some Fantastic Betting Offers for the 2008 Wimbledon Championships so be sure to give them a try. Stefan Mattson, a twenty-eight year old Swedish native has been making big waves with his attempts toward a third cash at the 2008 World Series of Poker. His unusual style and attitude toward the game has worked out so far and fans are ready to track future developments as the tournament continues. Mattson is completely self-taught and turns his nose up at the idea of studying serious poker theory. He came up from playing cards with family members and learning from only his own experience. When Mattson began to vie for professional leagues in 2004 he quickly became a bigger name, cashing during both times when he sat at the Main Event of the World Series of Poker. The newly famous Mattson was quickly snapped up by the Purple Lounge team and is now enjoying the benefits of being a company sponsor. With the continuation of the enormous annual event he is set to have a perfect streak as a successful, big money player able to take home substantial earnings from the tough matches. As the competition continues to play out it will be exciting to see how far Mattson gets toward coming out on top. For now, spectators are excited to see if the self-taught Swede will be able to go three-for-three with his WSOP performances and cash big again. Tracey Claire, a forty-four year old woman from Birmingham is ready to take on any competition in her attempt at gaining the title of Gala Bingo’s “Caller of the Year”. The Sutton Coldfield resident has been a star at the Stockland Green Gala hall and is the only female coming up against seven men in the finals. Claire has been playing bingo for over twenty years and calling for about seven. She was first introduced to the job when filling in for a sick co-worker. Still wearing her line-cook clothing, Claire took the stage and discovered her future career which she now does full-time to the enjoyment of players at the Stockland Green. Entry to the Gala Bingo Caller of the Year awards have all been made and now the participants are ready to be judged on criteria including presence on stage, interview technique and appearance. The title will be decided by a panel of judges on June 29th at the Kingsbury Road Gala in Birmingham. Supporters of their local participants are set to attend the competition to cheer on the local callers they know so well. Winners will receive a cash prize along with eligibility to audition for appearance as a star bingo caller on Gala TV. Rank PLC, the company which owns and operates industry giant, Mecca Bingo have sold further shares of the enterprise to the Guoco group of Malaysia. The recent business transaction has meant that Guoco now owns 12.67% of Rank’s overall holdings and has further spurned rumors that a full-scale takeover may be in the cards. Although land-based bingo halls have been suffering in recent years, Mecca Bingo has still maintained a formidable presence as one of the premier online offerings, making the transition from traditional to virtual business seamlessly. The company’s ability to keep pace with the times along with the brand recognition which Rank enjoys in the UK means that their operations present an enticing option for foreign investors. Although for now this move only means an influx of funds for Rank’s business there have been members of the press who foresee larger implications for the future. With Guoco’s transaction London-based observers have continued to speculate that a bid may soon be placed to buy out Rank PLC entirely. This theory is further supported by the purchase of an 11% holding in the business by the Genting group, a fellow Malaysian company with interests in the online gaming industry. Whatever the case, players themselves should be able to take heart that Rank and Mecca Bingo itself are in no danger of losing funding anytime soon. Mounting troubles have seen the Gala bingo hall in Birmingham finally announcing plans to close up shop in yet another example of escalating trouble for land-based arenas. The Great Barr club will shut down on June 23rd leaving seventeen employees without their jobs and a community without the social impact provided by the venue. The high number of bingo players who have chosen online services over physical halls due to smoking bans has meant a drastic decrease in financial viability. Coupled with continuing double taxation laws and the removal of big jackpot machines the Birmingham Gala has had no choice but to plan a complete shut down. Bingo has been hit most intensely of all the gambling options in the UK and the popular pastime is quickly becoming impossible to maintain through physical halls. Although the internet is presenting a great alternative for fans, the British Chancellor’s refusal to rectify issues surrounding heavy bingo taxation is being blamed by many as the primary factor making halls lose business. Candover, Cinven and Permira, the private equity firm which owns Gala have expressed concern over the lost jobs and plan to attempt relocation (to neighboring Gala bingo halls) of those left disenfranchised. Last year alone thirty-seven bingo halls were forced to stop business and even more have closed as 2008 continues. However, the online Gala Bingo is doing fantastically well, so why not give them a try? 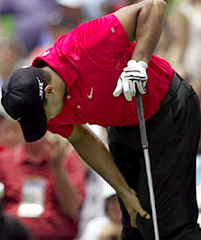 Last evening, Tiger Woods announced that he was out for the rest of the 2008 season becuase of his injured knee, and the problems that he suffered with it during his win at Torre Pines to collect the 2008 US Open Championship. This means that Tiger will miss the 2008 British Open at Royal Birkdale as well as the 2008 USPGA and the 2008 Ryder Cup. "It was important to me that I disclose my condition publicly at an appropriate time," Woods said on his website. "Now, it is clear that the right thing to do is listen to my doctors, follow though with this surgery, and focus my attention on rehabilitating my knee." So, this rather throws the world of Golf right open for the rest of the 2008 season and it must give the Europeans a massive advantage in the Ryder Cup. I am going to Royal Birkdale with my Son for the 2008 British Open and I know that we will miss Tiger not being there. But we can still watch the other major players and I am sure it will be a fantastic event. If you fancy a bet on any Golf or other sporting events, why not give Paddy Power a try? We have reviewed their sports book and are partnering with them for all major sporting events. Last year’s Man Versus Machine Poker Championship saw the top-of-the-line Polaris computer narrowly beaten by human opponents but the system is now being readied to try again in an upcoming event. This odd competition is a great opportunity for poker fans to take in a unique competition as well as providing artificial intelligence testing for scholar’s observations. Developed by the University of Alberta’s Computer Research Group, the further improved AI of the Polaris 2 has been tailored to stand an even better chance against competition this year. With advancements in AI and programs implemented to allow Polaris the ability to learn from mistakes and player styles during matches the unusual tournament could have quite a different result at the summer match-up. The technology employed in the Mark II Polaris is highly advanced and is set to push human players to their fullest abilities. A similar format from the former event has been adopted with Polaris 2 playing a controlled match against poker professionals. Ijay Palansky, Nick Grudzien and Matt Hawrilenko will make up the flesh and blood opposition to Polaris this year and hope to again prove that even the most advanced computer system cannot outdo humans just yet. The 2008 Man Versus Machine match will take place early in the month this July at the Rio All-Suite Hotel in Las Vegas as part of the Polaris Computer to Play Against Human Pros Again. We have just uploaded a review of the Paddy Power Sportsbook here at Findabet.co.uk. Paddy Power are the largest bookmakers in Ireland and they have a great Internet presence. Their money back offers take the sting out of losing your bet becuase your horse falls, or your player gets sent off. The review is posted for you to read, alternatively you can go straight to PaddyPower.com and sign up. In a strange bit of news this week, noted poker pro, Caspar Berry has been slated to give a speech regarding business lessons through cards to a group of insurance company risk management personnel. Berry is perhaps best known for his work as a former poker star and adviser for the most recent James Bond film, “Casino Royale” but was also employed as a screenwriter and actor before pursuing poker as a full-time career, the career path which eventually led into public speaking. At the conference Berry will be the leader of seminars comparing the assessment of real-life risk taking to that of insurance policies. The professionals attending are concerned with determining the necessary criteria for insurance companies in the business of car, home and life plans. Taking queues from the poker world makes the subject colourful and allows Berry the ability to present big ideas within the framework of a well known game. It is an interesting choice of speakers but Berry has proven that his theories deserve note and may be of more value than mere novelty. The relationship between a professional poker player’s knowledge of risk assessment is a fascinating subject which the speaker is extremely well versed in. The Association of Insurance Risk Managers Conference will be held Tuesday June 17th and Wednesday June 18th in Edinburgh. A recent report shows that the devoted fans of online bingo may be moving on to slots as their new favourite Internet pastime. Within the last six months alone an increase of players has blown up to ten times that of the past showing that the online market is in no danger of drying up. Online casino, Vernons.co.uk demonstrated the rapid increase of this trend through the traffic reports of their immensely popular ‘Clover Rollover’ jackpot slots. The craze has been able to feed into itself with more players flocking to slots and thereby increasing progressive payouts which inevitably ensure a desirable draw. As smoking bans keep certain players out of land-based casinos the growth of the industry as a whole can be expected to keep pace with its ongoing success story. Virtual bingo and poker rooms have been picking up steam for a while now making it seem as if Internet casinos and the always popular slot machines were only waiting for their audience to find them. Vernons continued research with the findings that their demographic consists of mainly female gamblers (at 62% of the total players) and middle-aged Brits (between thirty-five and fifty). With this trend, jackpots will be sure to continuously skyrocket and attract even more players to online slots. Many online poker fans already know that PKR offers some of the best-looking and most significant forms of innovation to be found within the industry but a recent poll by Hitwise has confirmed the site as the most popular in the industry. The survey was conducted via traffic monitoring and revealed that PKR received the highest volume of visitors of any online poker room in the UK. Through their dedication to breaking ground while still remaining competitive toward important industry features (such as bonuses and good tournament schedules) PKR has deservedly found itself as a favourite for many players. Their earlier move into televised events and partnership with the Merge Network have obviously attracted a lot of attention toward PKR and, once there, the revolutionary ‘Emote Control’ software featured on the site has managed to keep users loyal. PKR’s Managing Director, Simon Prodger was enthusiastic in a press release regarding the news, stating that it was reassuring to know that Britain was so dedicated to the site (which has never offered service to American players). With it being only partway into the year PKR is in a great place to continue their success story. With an unsurpassed level of graphical quality enormous and fan base the company should be able to go even further with their vision and maintain their status as the premier internet poker destination. Poker legend Annie Duke has been grooming young up-and-comer Liv Boeree for the upcoming World Series of Poker with the hopes that her student will be able to take home the coveted bracelet. Although Boeree has proven that she’s no slouch herself by taking first place (and $30,000) at the Ladbrokes Poker European Ladies Championship the professional tutelage of Duke is sure to come in handy for her looming competition. The two have been acquaintances since the 2005 UltimatePoker.Com Showdown after which Duke was able to help Boeree get her career as a professional poker player launched. With her eventual signing to the Absolute Poker teams the young astrophysicist turned card shark started to come into her own within the industry. With her striking looks, dynamic personality and formidable presence at the tables Boeree has become a phenomenon in the poker industry and the next step seems to be a great run at the WSOPs. In recent months, Boeree has managed to keep up an astonishing track record, taking ranking or first-place wins in a large number of London-based Texas Hold ‘Em tournaments and spreading her name through internet games. With Duke’s continued support and the guidance which can only be supplied through years of experience, Boeree could be in a very good position to emerge at the top of the events this summer. British television station ITV has recently announced the addition of Bingo Night Live to their network. The program will feature free play and is hosted by celebrity callers Melinda Messenger and Michael Underwood. The former model, Messenger and TV personality, Underwood will present numbers and entertain viewers during the one hour show. Players can grab complimentary cards on the Internet prior to broadcast then play along as the two hosts announce winning numbers. The show will also feature innovative segments by statistics reporter Nichole Dixon who is able to report on winner patterns and other interesting facts or figures with her interactive map of the United Kingdom. Bingo Night Live is offering big jackpots and various other non-cash prizes which should keep players coming back to follow the events. With the fate of Britain’s favourite game on the line during times of economic distress and closing bingo halls this program could be just what the nation needs in order to revive interest. The free play and entertainment focused nature of the show should be more than enough to attract participants and keep them tuned in five nights a week. Bingo Night Live will air between Tuesdays and Saturdays at midnight on ITV1. Although Ladbrokes Poker could be content to settle on its laurels the company has recently announced a site redesign which hopes to attract even more business through improved features and enticing rewards. Ladbrokes Poker’s managing director Edward Ihre stated that although the corporation has enjoyed considerable success in the European market it wants to show users a continued attention to detail by staying a step ahead of competitors. Players will now be greeted with promotional information and industry or brand news upon logging in. The main page has been made neater and, perhaps most interesting of all, Ladbrokes has finally taken steps to streamline their poker client with the sister casino and instant play sites. With this move poker players will now be able to see all communities merged along with receiving access to everything on the Ladbrokes network without having to juggle passwords or accounts. This move could attract even more attention to the service by demonstrating Ladbrokes commitment to customer loyalty. Although the improvements may not have been absolutely necessary the corporate willingness to put money toward bettering a site which wasn’t broken in the first place demonstrates a level of care which will escalate competition within the industry, something that always leaves the fans with better services. British bingo conglomerate the National Game has been supporting charitable donations for breast cancer research since 2003 and now plan to launch a continued effort along with the Bingo Association via the ‘Bingo for Breakthrough’ week slated for October. The events are set to raise a substantial amount for research contributions as over four hundred UK bingo halls participate in raising awareness and encouraging donations. Many of the biggest bingo companies have signed up in support including Gala, Mecca, Buckingham and Castle Bingo along with various others. As Britain’s favourite pastime rallies attention to their cause many celebrities have also pledged their assistance as well by offering donations such as autographed bingo cards. The National Game and Bingo Association’s partnership makes huge charitable action possible even in times of financial distress for the industry. ‘Bingo for Breakthrough’ will take place this October from the 19th through until the 25th and has the potential to raise a great deal of much needed money. Similar efforts resulting from the partnership of big bingo companies and breast cancer foundations have raised proceeds as large as £2.5 million with last year’s efforts alone amounting to an enormous £500,000 within the week. France has recently began working toward the opening of a controlled market for online gambling including poker rooms, casinos, betting services and various gaming sites. With the new bill being brought before national parliament this fall there could be great changes made and the eventual result of larger reforms in European gambling practices. Eric Woerth, the French Budget Minister has been drawing up guidelines which would see the awarding of licenses to businesses that adhere to the proposed legislature. Woerth is working closely with Charles McCreevy, European Minister for Internal Market and Services. The pair has been instrumental in developing a realistic bill which would see the nation keeping pace with obvious and popular demand for online gambling. If the movement is passed France will develop a regulatory body with the power to watch over a highly regulated (but legal) market. This liberalized view would likely have a large effect on a more domestically centered gambling business. If the French gambling market opens up for business this autumn it will mean a drastic change and a standard being set for other European observers. The industry must hold their breath until a final decision is arrived upon in a few months but for now the changes being suggested by Woerth and McCreevy hold significant hope for the continent’s gamblers. British gaming news has recently seen a drastically increased focus on the uncertain future of land-based bingo halls with every day bringing seemingly worse events. Several factors have contributed to this time of crisis and the combination of so many different drawbacks is quickly making the continuation of physical bingo halls a poor financial decision for many owners. The withdrawal of Gala Bingo from the National Game and the continuation of strict smoking bans have meant that physical bingo halls may quickly find themselves becoming things of the past. Combined with this, business owners have reported that double-taxation laws and the requisite cutback of £500 jackpot machines have significantly hurt their profits. As the Guardian reported hundreds of bingo clubs closing up over the past few years it also illustrated the social impact which have resulted from this. Over three million Brits frequent bingo halls but even with such a dedicated support base the lack of profits is becoming too much for club owners to compensate for. As online bingo sites continue to fare well many players may find that the closure of physical halls is quickly coming to represent a potent sign of a dying time. The example set by Gala Bingo is only one which shows that the cost of maintaining a real contribution to the land-based community may be unwise for a company which could divert its funds into an equitable website offering. Paul Barnes, CEO of DevilFish Gaming has been making industry headlines as his internet poker service gears up for a second launch of the site through the Entraction network. The replaced software has changed the overall aesthetic of DevilFish greatly and will at least temporarily attract a lot of continued attention. DevilFish is doing a lot to gain in popularity and with the revamped design of the site users can expect a wide array of extra promotions as well. The client was previously hosted through Excapsa software (the same network which hosts major industry leaders, Absolute Poker and Ultimate Bet) and is named after the famous UK poker player, Dave “DevilFish” Ulliott. With Ulliott’s continued support and enough controversy surrounding their recent business moves to keep DevilFish Poker in the headlines there should be plenty of interest surrounding the page in the near future. DevilFish seems to be interested in taking advantage of their situation by roping players in now and attempting to impress them enough to stick around. Users will have to try the new version out for themselves in order to see exactly how well it stacks up to the former service. Only time will tell how successful DevilFish manages to remain after the dust surrounding their move has settled but if their gamble pays off it could mean another serious competitor within the industry. Industry leaders, Gala Bingo have been making big news lately with their controversial decision to withdraw from Britain’s National Game, a mainstay of the bingo community that sees one third of its jackpots coming from the now removed company. The National Game occurs twice a day all throughout the year (excluding only Christmas Day) and was conceived in 1986 as a means of drumming up business for all bingo halls across the nation. By retracting their participation Gala has understandably upset many of those who have counted on their support for more than twenty years and detractors have since accused the corporation of being overly selfish. With more than three million British citizens frequenting the National Game in the past this move may raise significant outcry. The remaining contributors are in doubt as to whether the historical promotion will still be able to function with such an enormous part of its funding now knocked out. While Gala Bingo is probably more concerned about their own company interests than the National Game this may hold larger implications for the future of the industry. As smoking bans hold some fans of the game back from halls the end of physical bingo play may be approaching. Other companies may choose to tighten their online interests in lieu of supporting the National Game in the future as well which could very well mean the closure of a great deal of bingo halls and the end of an era in the games history. The notoriously crime-plagued gambling industry in South Africa has finally been formally addressed by the country’s parliament in a move that seeks to regulate and profit from the popular practice. South African officials have long recognized that internet gambling has been an area which attracts money launderers and has even led to terrorism funding. A National Gambling Amendment Bill is now attempting to ratify the situation by more carefully monitoring gaming websites and electronic funds transfers. The committee behind the revised legislature wants to improve the international reputation of South African gambling while stimulating the economy and weeding out the currently prevailing influence of dangerous criminal elements. Aside from this, the National Gambling Amendment Bill proposes programs to stop addictive gambling issues before they begin in order to promote the industry as a potentially benign (and positive) one for the future. The Bill would also require player registration with certified internet gambling providers along with the submission of an age verification affidavit. The Amendment is still awaiting the final step of an approval signature from President Thabo Mbeki but once this is carried out South Africa expects to see the national economy’s online gaming revenue increase by more than double its current status. Once the Bill becomes part of official law the South African National Gambling Board will begin enforcement and regulation of the new rules. Parliament in Holland is still hesitant about getting into online gambling markets as demonstrated in a recent case with the giant Casino and Poker client, BetFair. The Dutch government has remained steadfast in their refusal to grant BetFair a gambling license within the nation which is indicative of bigger problems in European trade. The Netherlands Council of State ruling has essentially placed BetFair’s proposal in legal limbo for another two years which shows that the Dutch government plans to stall not only this one company but all similar services from accessing the country as a point of entry toward larger European gambling business. With the European Union’s attempts to fully establish free trade across the continent it is troubling to see Holland stay so resolute on their national gambling monopoly and BetFair’s case can be understood as having implications far beyond a single company’s plea for expansion. With the regular news of Dutch resistance to open business with many British online gambling networks, onlookers see a dismal future toward enjoying the economic prosperity offered by a Europe meant to be united past national borders. Popular dissent against this type of legislature is still strong however, meaning that perhaps before too long these rules may need to be revoked before the European Court of Justice looks into the case further in two years time. Inside Gaming is one of the premier software and gaming systems companies and they have recently announced a partnership with Income Access Software as a means of creating improved affiliate functions and business plans across a number of clients. The company recently told the press that this partnership was sealed and spoke of their plans to add their combined skills to the Better Poker and Better Casino services. The extra boost which will be given to these already established sites will come by way of an improved management plan that the partnership will provide. Inside Gaming and Income Access Software hope to give their services to many a gaming website and improve their business through improved affiliate and company management. Their now joined skills could overhaul the average business into a powerhouse; Inside Gaming is reputable in their ability to aid the business plans of emerging online gambling companies and Income Access provides some of the best affiliate marketing software available. To the average online casino or poker room visitor this may not seem like big news but the implications could be far-reaching if this partnership is able to use their status for a number of sites. As more and more gambling networks are established on the Internet the solid skill set provided by Inside Gaming and Income Access Software could see a large increase in fantastic websites for users to frequent.